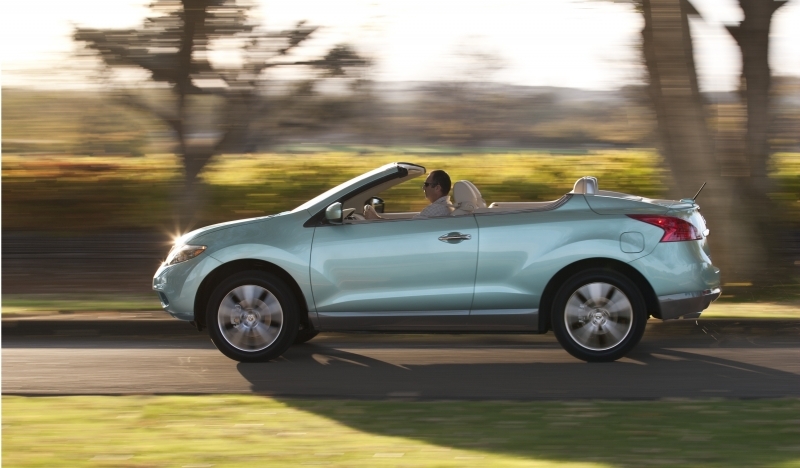 At first blush, the 2011 Nissan Murano CrossCabriolet seems designed to render automotive critics speechless. It doesn’t have any direct competition. Doesn’t care about being either sporty or utilitarian. Doesn’t really resemble anything, except for perhaps an Amphicar. We’re used to writing about vehicles that slot neatly into established segments, not near-$50K crossover SUVs that are missing two doors and a roof. Rather than try to judge the Murano CrossCabriolet by our usual standards, then, we’re just going to appreciate it for what it is: a novelty item—a niche product that holds appeal precisely because it’s so unconventional. To wit, there are zero other convertibles out there that ride softly and provide four adult passengers with ample space and an SUV’s commanding view of the world. Nissan even throws in all-wheel drive for snow-belt residents who would rather not relegate their drop-tops to hibernation every winter. Hey, wait a minute. Maybe this thing makes some sense after all. The Murano CrossCabriolet rides with both grace and substance, just like the top-notch crossover SUV on which it’s based. Its elevated hip-point gives passengers a uniquely expansive perspective, and the roomy backseat is a veritable throne relative to the rear quarters in most convertibles. The mandatory 3.5-liter V-6 is smooth and capable once it gets going, and the standard all-wheel-drive system makes this Nissan a true four-season vehicle. Thanks to conservative transmission tuning and a bit of a weight problem, the CrossCabriolet feels sluggish off the line. Cargo space is very limited, and fuel economy is predictably poor. Cowl shake is noticeable over rough pavement. The CrossCabriolet’s high center of gravity and cushy suspension mandate a gentle pace on winding roads, though this will likely suit the target buyer just fine. 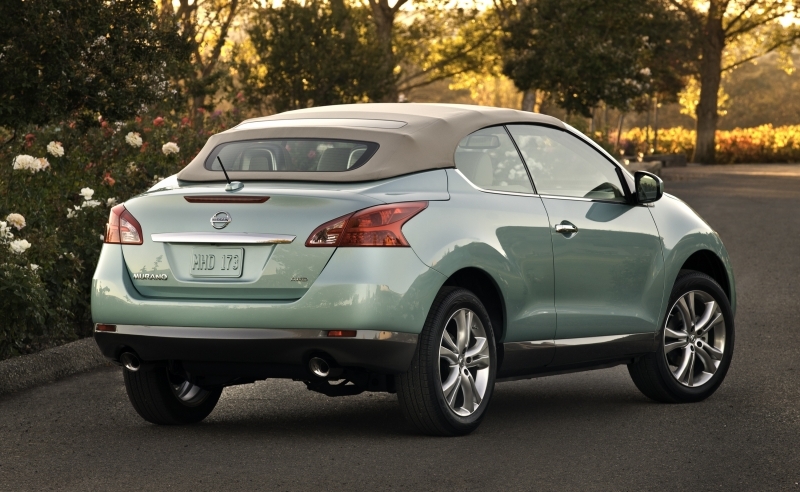 The Murano CrossCabriolet soaks up bumps and ruts with minimal fuss. You’ll notice those imperfections in the wiggling windshield—“cowl shakeâ€ is the technical term for this—but you’ll hardly feel them through the seat of your pants. With the soft convertible top in its closed position, road and wind noise are respectably hushed, though some hard-top convertibles are quieter. Power down that top—a painless process with no separate tonneau cover to worry about, by the way—and you’ll be pleased with the lack of wind buffeting, even at near-highway velocities. On twisting tarmac, the Murano CrossCabriolet is more capable than, say, a Jeep Wrangler, but it trails just about every other convertible in athletic ability. Cruising, not cornering, is this Nissan’s forte. The all-wheel-drive Murano CrossCabriolet is motivated by a 3.5-liter V-6 rated at 265 horsepower and 248 pound-feet of torque. 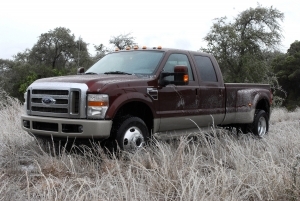 The transmission is a continuously variable automatic (CVT). In an effort to make the gearless CVT feel more like a conventional transmission, Nissan has programmed it to increase engine speed smoothly and progressively rather than jump straight to the engine’s power peak. This results in unusually soft off-the-line acceleration for a V-6-powered vehicle, a problem that’s no doubt exacerbated by the CrossCabriolet’s 4,438-pound curb weight. The V-6 itself is excellent, however, providing smooth and robust performance once the CVT lets it sing. The CrossCabriolet’s vinyl top is one of the largest in the business, and Nissan has made good use of that extra real estate—rear passengers are treated to a glass skylight above their heads, a welcome source of daylight in top-up conditions. They also get roll hoops in their seatbacks that automatically pop up in the event of a rollover. Additionally, an unusual “camelâ€ leather interior with a rich tan hue can be specified. Given that the regular Murano has four doors, it’s worth repeating that the CrossCabriolet only has two, a reluctant concession by Nissan to structural integrity. Standard on all CrossCabriolets is a navigation system with a 9.3-gigabyte hard drive, which can be loaded up with digital music to be played on the satisfying Bose stereo. The interface, featured in a wide range of Nissan and Infiniti products, is one of the most user-friendly in the business. Bluetooth and iPod connectivity are also standard. The navigation screen transforms into a rearview monitor when reverse is selected – a necessary feature in the high-rumped CrossCabriolet. 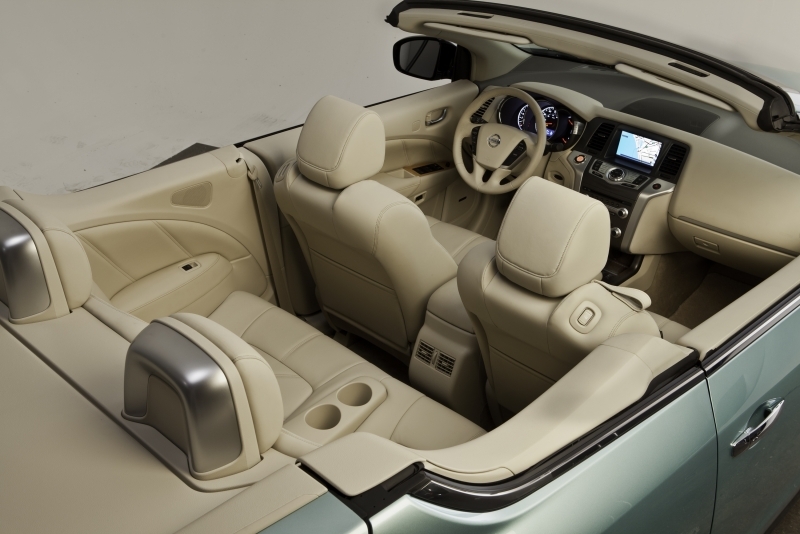 The Murano CrossCabriolet is EPA-rated at 17 miles per gallon in city driving and 22 miles per gallon on the highway. It’s not very green, in other words – nor would we expect it to be. For reference, the regular Murano yields 18 city, 23 highway. The CrossCabriolet’s dashboard is attractively simple, and the materials that cover it are of appropriately high quality. The elevated ride height is such that you’ll feel like you’re atop a parade float. Seat comfort is satisfactory in front and exceptional by convertible standards in back. Cargo capacity is a lowlight, however, at 12.3 cubic feet with the top up and just 7.6 cubic feet when it’s down. The best we can do here is remind you that the CrossCabriolet is a Murano with two doors and convertible top, and that in itself makes it a polarizing design. It’s actually not so awkward in person, though putting the top down certainly enhances its appeal. What else is out there? The four-door, soft-top Jeep Wrangler Unlimited comes to mind, but it’s obviously aimed at off-roading enthusiasts, not suburban pleasure-cruisers. Here’s something to chew on, though: if you go light on the options, you can get a BMW 3 Series hardtop convertible for CrossCabriolet money – which equates to around $50,000. 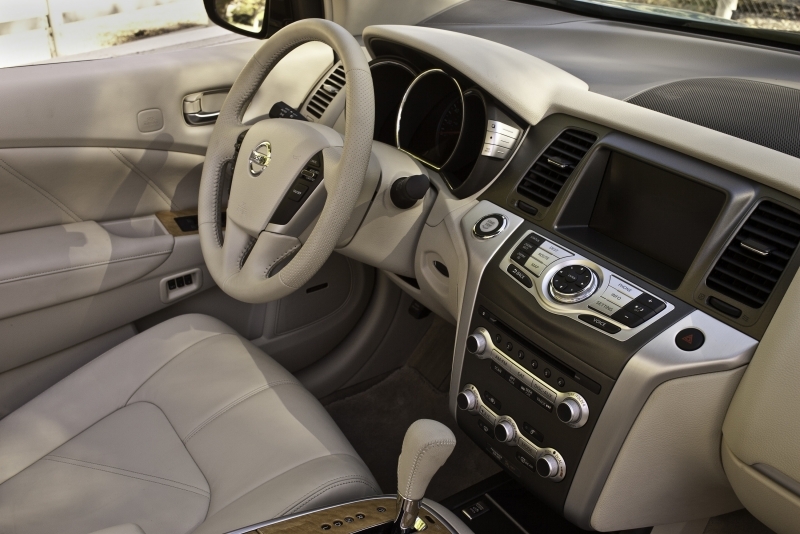 The question there is whether you’ve got to have the Murano’s SUV-level seating or all-wheel drive. When we really ponder the CrossCabriolet, we can see why Nissan built it. It rides nicely, it gives four adults space and a view, and you can drive it through the winter like any other crossover SUV. Tri-winning! If a few thousand people a year think that’s worth almost 50 large, maybe it’s good we’re not the ones running Nissan’s research and development division.